Do you want to catch the big fish? Night bass fishing in the summer time is one of the best times for catching those seemingly elusive lunker largemouth bass. 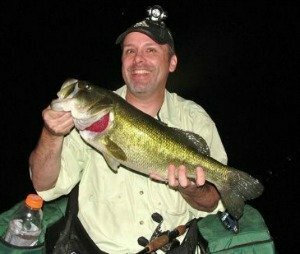 Largemouth bass fishing at night time gives dedicated fishermen quite a few advantages as opposed to fishing during the day. 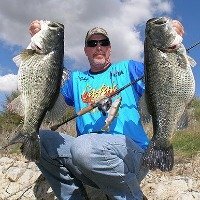 One of the main things to understand is that bigger bass tend to be lethargic during the day time, and will roam the water and feed more throughout the night. Why do many of the larger sized fish hideout during the day? There are a number of reasons. Much of it has to do with the pressure from bass anglers or boaters. So, those fish will stage themselves in areas of the water and wait to ambush their prey. Whereas during the night time, those bigger largemouth bass will hunt down prey since those smaller fish most likely will not be as suspecting of anything lurking around in the dark waters of the night. Have you ever wondered how some largemouth bass grow into lunker status? By being cautious and smart! Now it's time for you to be just as smart, since you now know some of their main habits. Before you head out to go fishing at night, be sure that you are already familiar with the area of water that you will be at. This means going out during the day to scope it all out. Take notes of key spots, the surrounding structure and cover, and the layout of the area. The last thing you would want is to go out there feeling blind folded and get into a serious problem like getting stuck out on the water all night long. As always and with anything else, safety first! Be sure that you are totally prepared for any out of the ordinary circumstances. To save yourself time and hassle, get everything organized prior to leaving. Check your boat lights. Take a flashlight or spotlight with and extra set of batteries. Wearing your life jacket should go without saying. Only take the tackle and equipment that you need. Rig up your fishing rods and reels and have them set to go. The natural light of the moonlight with help you to see and navigate around. You'll be able to make better casts to structure and around key spots. It also helps bass to see your fishing lures better. Not only that, you'll be able to see where those noises might be coming from when the bass are feeding on bait fish. Whether or not you have the moonlight, you can use a couple of artificial lantern lights, or even the sealed floatable or sinkable kinds. Hang them off the side of the boat down near or into the water, preferably on the other side of where you're fishing from. The light will attract mosquitoes and other insects and weird bugs, so you may want to douse yourself in bug repellent. The bugs will attract bait fish, which will attract the bass fish. This process may take about an hour so just remain patient. Ultraviolet lights are good for keeping a better eye on your fishing line. Lines such fluorescent monofilament will glow under these type of lights, which will let you know where your lure is at, how much slack and tension is in the line, and also help you detect those lighter subtle bites. The night time hours from dusk to dawn allows for the perfect opportunity for top water bass fishing tactics. Prop baits and buzzbaits are excellent producers for catching bass at night. The continuous rotation of the propellers motoring through the top of the water help attract bass to the sound coming from the lure, which will naturally trigger them to strike. Cast these prop baits and buzzbaits past trees, stumps, lay downs and other woody structure, as well as weed beds and grass lines. Then steadily retrieve the lures back to you across the structure and wait for those aggressive largemouth bass come up to blow up on your bait. Stick baits for the walk the dog techniques are another great way to call up largemouth bass. Work them as you would normally, yet use a more rapid snap and retrieve. Snapping the rod tip a little harder will create more water disbursement and noise to give the sense of bait fish in a feeding frenzy. To get even more commotion in the water, you may also want to try this walk the dog tactic using a popper or a prop bait. Poppers or chuggers have a concave mouth designed to catch water in a way to make that loud popping sound and disperse water. With slack in your line, quickly snap the rod tip down, reel in the excess slack and let the popper set until the water settles, then repeat. Largemouth bass most often will attack the popper when it's just sitting there. Lunker largemouth bass are known to consume reptiles such as snakes, lizards and frogs. Some of the biggest hawgs are caught on snake like lures. Whether or not you have a plastic snake bait, you can also use a large profile bait like a 10 to 12 inch soft plastic weightless worm. These are great attracting lures for night bass fishing tactics. Cast the snake lures out towards the shoreline and slowly reel to swim them back towards you. Swim them across the top of vegetation and through woody structure. Just be ready and hang on to your rod because when a bass strikes, it might be a huge and ferocious hawg. Like snakes, frogs are nocturnal. More importantly, frogs are another one of the largemouth bass' favorite creatures to feast on. Cast frog lures onto lily pads and other types of cover, wait to allow for the water settle, then slowly work the frog lure into openings in short spurts. There's no need to limit yourself to fishing with only top water baits, unless that is your main plan of attack of course. 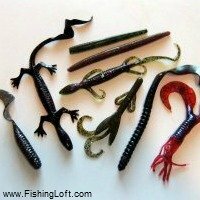 You can still use your other favorite bass fishing lures while on your night bass fishing adventures. The same rules for color selection apply - because it's dark when night fishing, you'll want to use darker color lures so that the bass can detect them much easier. You might also want to upsize your fishing lures for even better detection, especially on darker nights when there isn't a moonlight. Bass Pro Shops has some cool night bass fishing gear and equipment. They have everything that we've covered above, such as floating lights, submersible lights, ultraviolet black lights, headlamps, neon sticks, bobbers, midnight special colored spinnerbaits, lures, bug repellent, clothing and much more. Check out their great deals on night time bassin' equipment.